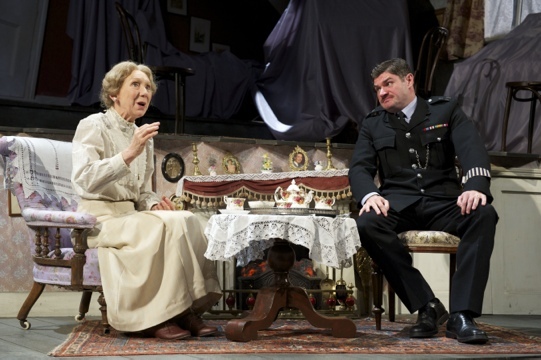 Now that I have your attention let me rephrase that: London Theatre is awash with farce. There are three crackers on the go at the moment, the perfect way to brighten up a cold winter night. And if Man in Chair must see a show without songs it might as well be a comedy. 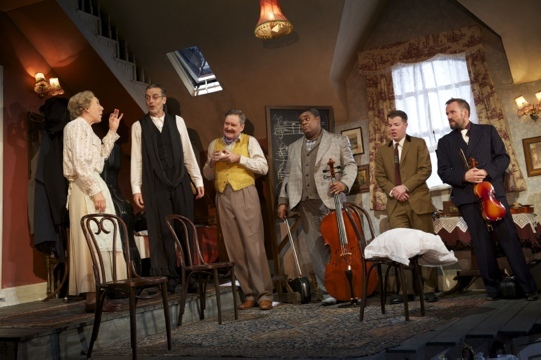 Based on a classic 1950s British movie, The Ladykillers is notable not just for its broad comedy but for its unexpectedly eye-popping set. When old lady who cried wolf, Mrs Wilberforce, hosts a posse of career criminals posing as a string quintet, money, misunderstandings and murder are on the menu. While the opening set of the front of Mrs Wilberforce’s Kings Cross home would, dare I say it, be more than sufficient for the production values of an Australian play, it quickly rotates to reveal the most incredible multi-levelled, multi-angled interior that is Escher-like in its visual complexity. There a more tricks in store, as the house rattles and shakes whenever trains pass by. The robbery sequence is told in delightful fashion by model cars and trains. The final death, for the men prove to have no chance of dispatching unwilling accomplice Mrs Wilberforce, is a spectacular effect that is at better seen first hand than disclosed here. There is plenty of laughter and action, but a surprising lack of tension driving proceedings. An ideal matinee treat nonetheless. ‘Hysterical’ doesn’t really do justice to this updated commedia dell’arte stunner, London’s current hottest ticket. 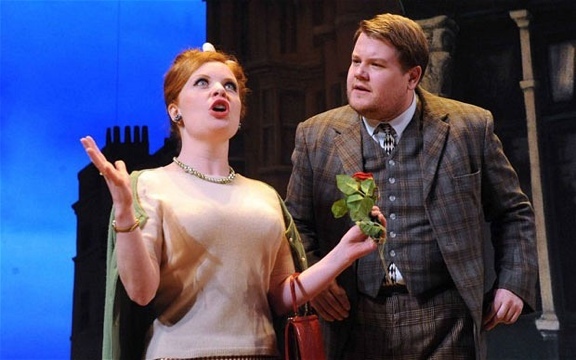 Transferred to the Adelphi from the National Theatre, where both seasons sold out, it’s next West End move is to the Theatre Royal Haymarket with a new ‘Man’ while jolly James Corden sets off to head up the Broadway cast. Richard Bean’s take on The Servant of Two Masters sees the action transplanted to the bonny Brighton of 1963, home of grizzly gangsters and breathless babes. Francis Henshall (Corden) works for the deceased Roscoe’s (identical?) twin Rachel but soon also takes up with the exuberant Stanley Stubbers, Roscoe’s killer and Rachel’s lover. Corden’s heft is a plot point given Francis’ desperation for food but it’s surprising he hasn’t worked it all off giving this incredibly energetic performance eight times a week. 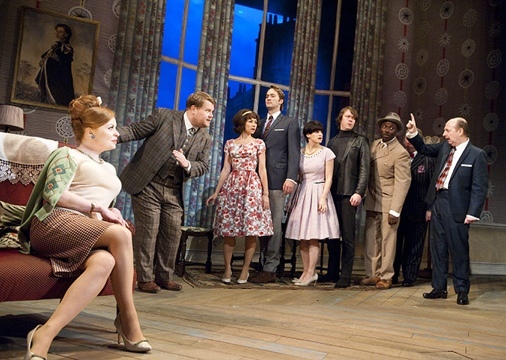 Slapstick abounds, with Corden’s particular gift being the earnest inclusion of the audience in his plight. He’s also handy with an ad lib, being ringmaster of some truly hilarious audience involvement. 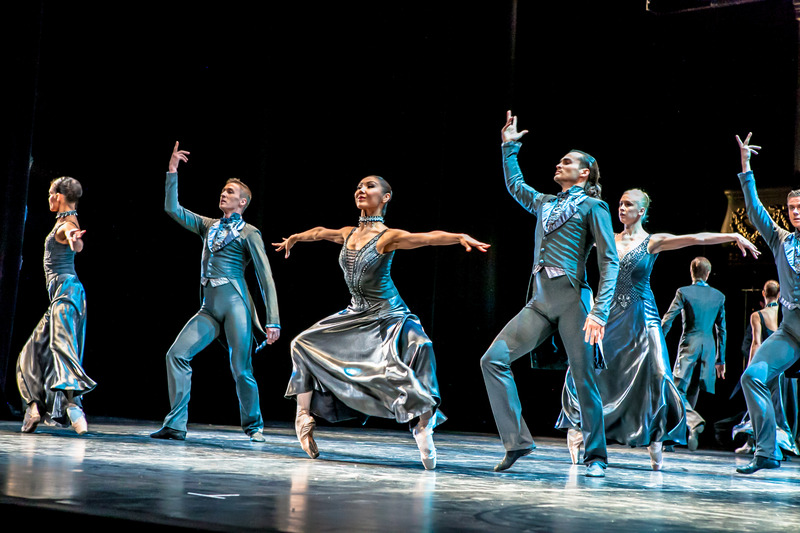 Corden’s tour de force performance is extremely well supported by a large cast of gorgeously colourful characters. Oliver Cross is a hoot as bombastic boarding school brat Stubbers, a toff indoctrinated by dubious life lessons learnt at school. 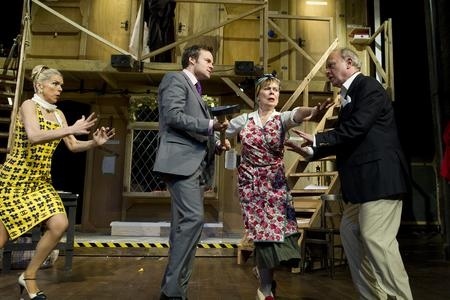 Suzie (below with Corden) is peaches and cream perfection as the world wise bookkeeper Dolly. Tom Edden has created an extraordinarily physicalisation of the ancient doddery waiter Alfie. Director Nicholas Hytner keeps the action at fever pitch, with generous dollops of physical comedy. Best of all, despite all characterisations played at full hilt, each actor is kept just this side of overacting, helping the somewhat surreal shenanigans seem strangely plausible. 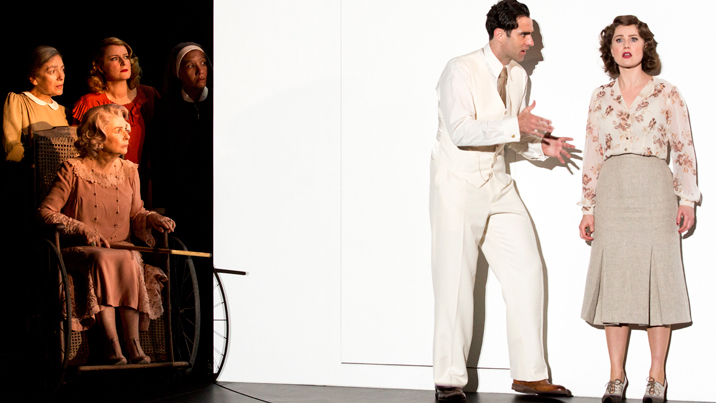 Mark Thompson’s picturesque sets and witty costumes conjure up an enchanting time gone by. Live musicians The Craze add to the festivities, supplemented by cameos from the cast during scene changes. The National took The History Boys on a world tour so why not One Man, Two Guvnors, only this time it’s Melbourne turn to host. 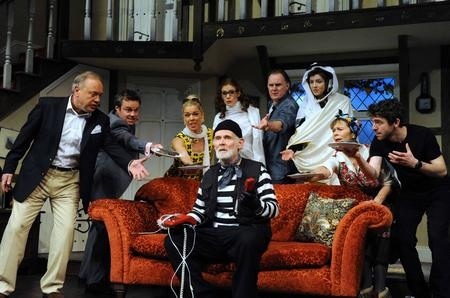 Noises Off features so much hilarity that it is almost impossible to take it all in. Michael Frayn’s classic farce is back where it belongs – on the London stage with a cracking cast at the top of their game. A brilliant script to begin with, Lindsay Posner’s direction adds so much physical comedy that at times it is hard to know where to look. Posner clearly has trust and communication at peak levels amongst the tight ensemble, who bounce off each other with split second precision, unlike the ‘actors’ performing the play within a play Nothing On. Comedy builds through the three acts as we see a hapless group of actors harangued by their director at dress rehearsal, then watch a matinee from backstage, then it’s back stage for the disastrous closing night of the tour. Anyone with even a passing experience in theatre will delight at the foolhardy egos and incestuous in-fighting on display. Peter McKintosh’s design is sturdy and charming. It seems an odd and obvious error, however, that the backdrops seen through the doors and windows are not there for the act set backstage. How Robert Glenister has any voice left is a miracle; his bellowing as exasperated director Lloyd Dallas is at full volume throughout. Janie Dee is a gorgeously warm Belinda Blair, helpful dispenser of snippets of cast gossip. Celia Imrie is a delightful scene stealer (in the best way) as dotty Dotty, hardly a siren but curiously attractive to all male characters. Wide eyed Amy Nuttall, looking eye-poppingly splendid in her underwear, achieves one of the strongest distinctions between characters, with her spaced out actress contrasting with her driven Nothing On character. Jamie Glover nails the vague arrogance of Roger, also pulling off a very impressive fall down the staircase. Jonathan Coy captures Frederick Fellowes, the well-meaning but increasingly doddery actor with whom we have all worked. 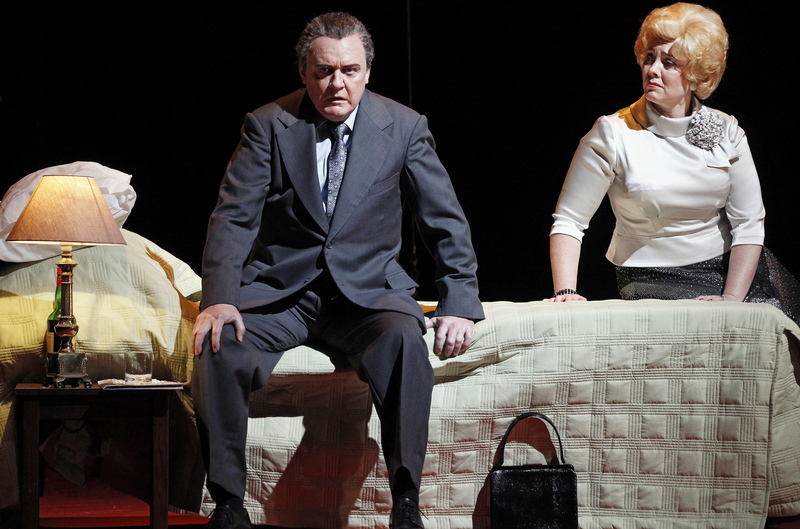 An expertly realized staging of a ripper of a play, this one is highly recommended.